Below is an image of the Franklin Reality Model. Notice how everything begins and ends with needs. In between the beginning and the end of the circular cycle are beliefs, reasoning, actions, and outcomes. The implications are that beliefs, reasoning, actions, and outcomes, are all directly related to "needs". What does this mean? It suggests that the launching pad of all human behavior is need. * Consider the woman who came to Jesus with an issue of blood, she had a need for healing. * Consider the 10 men who came to Jesus with leprosy, the had a need for a cure. * Consider the the disciples who awakened Jesus on the boat during the terrible storm, they had a need for safety. * Consider every unbeliever who has found forgiveness in Jesus, we had a need for salvation. It seems reasonable to conclude the reason that Jesus is the world's greatest leader is because he met (meats) people's needs. Ministers and leaders today can learn a a great deal from his example. If a leader meets people's needs, they will follow. 1) A person in danger of murder might change some of their beliefs in order to escape harm. How do needs become the window through which people form beliefs? 2) What sort of "if-then" associations and reasoning may result from a person's direct needs? 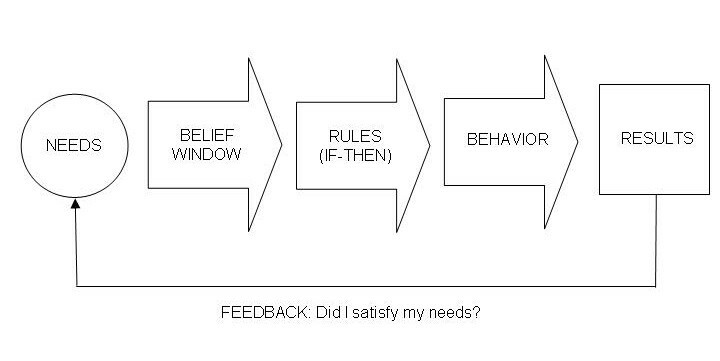 3) How do beliefs transfer into rules that result in behavior?